← What Do You Surrender? This is a much-needed topic with little published research. I not only read, but also reread this book several times. I wanted to give this book the highest praise possible. It is both well-written and well-documented and I can recommend it without reservations. The ebook format has some problems, though I was able to get it to work. The download off the Answers-In-Genesis email did not work. There was a very helpful phone number which was answered by a very helpful woman. She gave us a workaround that worked. Since I have an Android-based Samsung, and have the ability to download multiple ebook readers, I was able keep downloading ebook readers until I found one that worked. But if I had only a Kindle Fire, a Nook, or any other proprietary format, it would not work. I have a regular Kindle, a Kindle Fire and a Kindle app on my Samsung Galaxy Tab and none of these can read the Genius of Ancient Man. Though I am certain that the helpful customer service people would get the ebook to work on any format, this is more work than any ebook purchase should be. By the way, for GalaxyTab owners, I found that the Moon+ Reader works for this book. Though I have hundreds of ebooks, this is the only book I use the Moon+ Reader for. We contacted the publisher and eventually they told us that it was designed for the iPad. The New American Standard Version of the Bible is quoted throughout. For a technical work it is a good translation choice. It is also a series of monographs written by different individuals, so there are some points which are repeated throughout the book. 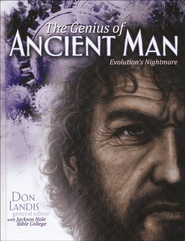 The cover credits Jackson Hole Bible College, along with Don Landis, for writing and editing. Jackson Hole Bible College owns the copyright. The documentation and the pictures are professional and use standard formatting. The links do not always work and there are line breaks which sometimes make sentences difficult to understand. This book begins by assuming a Christian audience that accepts the authority of the Bible as the Word of God but is not familiar with scientific archeology. Anyone with more than a High School education should be able to absorb this material quickly and easily. It also assumes that the timeline presented in the Bible is accurate and this information is laid out in several charts, graphs and columns. Sadly, these are not formatted properly and are difficult to read. Sometimes the text ends in the middle of a sentence and skips several pages before picking up again. Every one of these chapters deals with principles found in the Bible, but the book is more than half way through before it begins with the topic listed in the title, the genius of early man in chapter 5. Chapter 6 is the first chapter to begin to examine the physical evidence in some detail. There are many more examples included in the text. Many pages are devoted to the large stone buildings and statues found by the thousands all over the world. Chapter 7 is entitled “Worldwide Travel” and contends that ancient seafaring man circumnavigated the globe regularly. Chapter 8 is entitled “Monuments, Mounds, Pyramids…” and takes a more detailed look at many stone objects mentioned in chapter 6. There is a map of Indian mounds found in the USA. Chapter 9 is entitled “Religions and Legends” and examines the scientific evidences found in ancient writings such as the pyramid texts and the Epic of Gilgamesh. It also compares many different legends throughout the world and shows that common elements point to a common source. Chapter 10 is entitled “Music and Art.” With the wealth of material available for this topic, this is a disappointing and brief chapter. It is even short for an overview. Chapter 11 is entitled “Babel is not Gone.” This is a recap of the material covered from the Preface up to Chapter 5. Since this is done with greater brevity and more organization, it could easily replace much of the earlier material. This Chapter contains some detailed Axioms as well as evidence that does not seem to fit anywhere else. Overall this book does what the final quote above claims is its major premise. However, based on the title, I expected a great deal more material evidence and I must say that overall I found this book to be shallow and disappointing. It is a useful introduction to the subject, but I do hope there is a follow-up with more information.